The second and smaller temple in Abu Simbel is dedicated to the goddess Hathor and to Nefertari, the wife of pharao Ramses II. Also this temple has been carved into the rock wall. 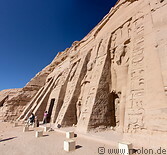 The facade consists of six 10 metres high statues, four of Ramses II and two of Nefertari. The interior of the temple consists of a hall with six pillars on which there are faces of the goddess Hathor. Also here teh walls are richly decorated with basreliefs and carvings.